Global flexible electronics market projected to cross USD 16.50 billion by 2021, growing at a CAGR of 21% between 2016 and 2021. The report covers forecast and analysis for the flexible electronics market on a global and regional level. The study gives historic data of 2015 along with a forecast from 2016 to 2021 based revenue (USD Million). 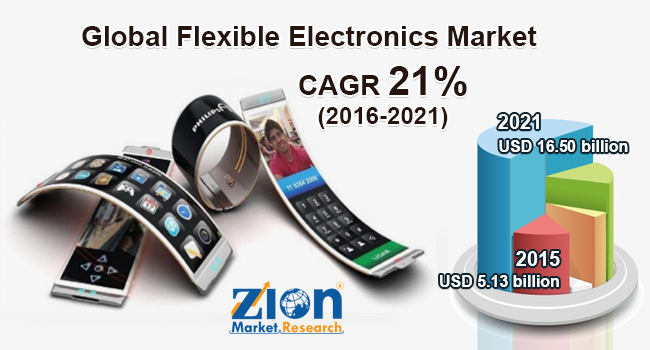 The study includes drivers and restraints for the flexible electronics market along with the impact they have on the demand over the forecast period. In addition, this report gives a comprehensive overview of the ongoing development in the market. In order to give the users of this report a comprehensives view on the flexible electronics market, we have included a detailed competitive scenario and product portfolio of key vendors. The Porter’s five forces analysis included in the report further help in assessing the market situation and competitiveness. Market attractiveness analysis highlights key segments of the market and their comparative attractiveness against other segments. The report includes company market share analysis to offer a broader overview of the key players in the market. Additionally, the report also covers key strategic developments of the market including acquisitions & mergers, agreements, partnerships, collaborations & joint ventures, new product launch, research& development, product and regional expansion of major participants involved in the market on the global and regional level. Moreover, the study covers patent analysis (2011-2016) bifurcated into the patent trend, patent share by company and patent analysis according to the region. The study provides a crucial view on the flexible electronics market by segmenting the market based on component, applications, and regions. All the segments have been analyzed based on present and future trends and the market is estimated from 2015 to 2021. Based on the component the market is segmented into displays, battery, sensors and memory. Key application market covered under this study includes automotive, consumer electronics, healthcare and industrial. The regional segmentation includes the current and forecast demand for Asia-Pacific, Europe, North America, Latin America and the Middle East & Africa with its further bifurcation into major countries including China, Japan, India, UK, France, Germany, U.S., and Brazil. This segmentation includes demand for flexible electronics based on individual applications in all the regions and countries. The report also includes detailed profiles of end players such as Samsung, Pragmatic Printing Ltd., PARC, Thinfilm Electronics ASA, Solar Frontier K.K., LG Corporation, 3M, Multi-Fineline Electronix Inc. and Cymbet Corporation, Inc.